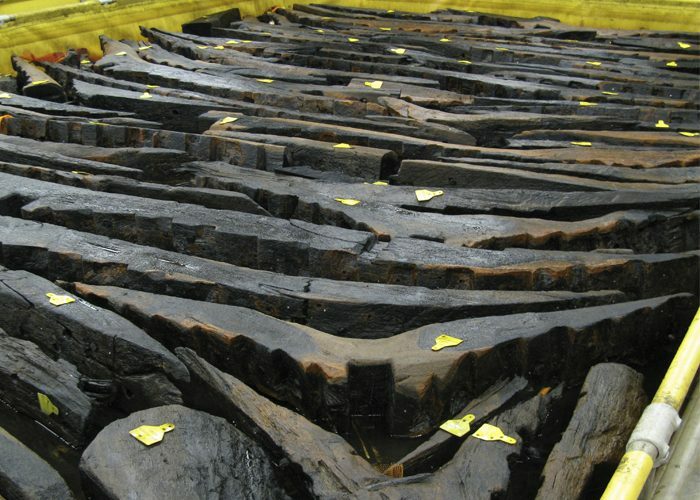 The conservation process for the Newport Ship has differed from that undertaken for famous ships like the Mary Rose and Vasa in that the timbers were all separated during the excavation phase. This means that each timber can be treeated simultaneously in large tanks, whereas the Mary Rose and Vasa both had to be sprayed continuously with preserving chemicals. Originally this was intended to be a two stage process where the timbers would be impregnated with a solution of polyethylene glycol (PEG) that would act as a bulking agent within the wood cells, replacing the water present and preventing those cells from collapsing as they were dried out. However it was discovered in 2006 due to the work of the Vasa Project in Stockholm that PEG reacted with the iron salts in the timbers. Therefore an additional step was added during conservation with the ship timbers being soaked in an ammonium citrate solution prior to receiving their PEG bath to remove most iron salts. After treatment in ammonium citrate and PEG, the timbers can proceed to the freeze-drying process. All of our timbers have now been fully saturated and the last 30% of them are still being processed through the freeze-dryer (at York Archaeological Trust). It is currently suggested that we will have all the dried timbers back in the climate-controlled stores at the Newport Medieval Ship Centre within 2 years.